I’ve always said church ladies are the best cooks! It’s all of the potlucks we have! This recipe was given to me by a special lady when we lived in Alaska. It is a once and a while indulgent dish, and so worth the calories! Just do a few extra jumping jacks! Melt one stick of butter in a deep skillet and add three cloves of garlic. Cook for a minute until fragrant. Add the chicken to the pan and cook until browned. Take out the chicken and set aside. Add the rest of the butter and garlic to the pan. In a separate bowl combine the sour cream, cheese, and flour. Once combined add to the melted butter and garlic mixture. Add herbs and chicken and let it simmer until chicken is cooked through, about 5 minutes. 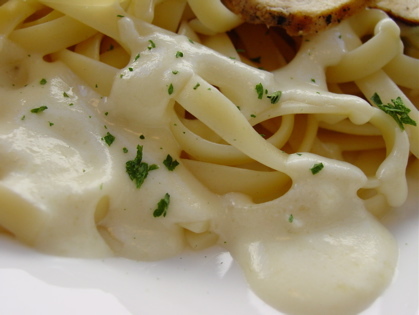 Serve over hot fettuccini noodles. This entry was posted in Favorite Recipes. Bookmark the permalink.